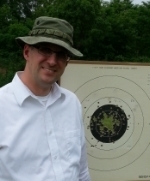 Indoor season is coming up, and this week at my club practice I shot a rimfire 900 for the first time in awhile. I am shooting T&R well (97 & up) but my slow fire is hanging in the low to mid 80's. My slowfire groups are larger than T&R, which drives me nuts. If I tighten slow fire I could see gaining 20 points, I need to do that this year. Shooting SF at a timed pace is no solution, clearly there's something I need to train & learn. I've been working through the USMC drills & it has really helped my T&R, what are some drills to improve slow? I dry fire. Begin trigger press as the front sight or dot enters the black. Continue this as you work the dot toward the "X". Don't wait until the shot looks perfect before you squeeze. You will surely move something else. With practice the break will happen sub consciously as the alignment is perfect. Don't try to "make" it perfect. Follow your shot plan and get out of the way. I would bet you are pulling the trigger too slowly and probably starting and stopping trying to get a good shot in slow. In sustained you are pulling straight through. You need one trigger pull for all stages. It should be fast, smooth, uninterrupted and not disturb sight alignment. When you start pulling the trigger this way in slow you will see more marginal shots (dot not perfectly centered) but you will also see fewer crazy flyers. When I get my shot plan correct, and the trigger is moving to the rear, the wobble stops, and the shot breaks. If I'm doing something wrong, the dot starts to move. That's my cue to abort the shot. The key is making sure your trigger pull doesn't move the dot. I don't care if my hold isn't good enough for all 10's, but I do want to be able to call the shots. If you can do that, you are able to figure out what you did wrong if it's not a 10. Like, bad hold, thumbing, jerked trigger, broke wrist down...etc. Ed Hall wrote: I put some info up on the list a long time ago, that might be of use for this topic. That's really helpful- thanks Ed! I've seen some of your old L list posts before but I've somehow missed the pages you linked. The progressive training approach is my kind of way to work through a problem- I can see this process paying off. I'm so glad to see you on the forum and really appreciate this article. Thank you.